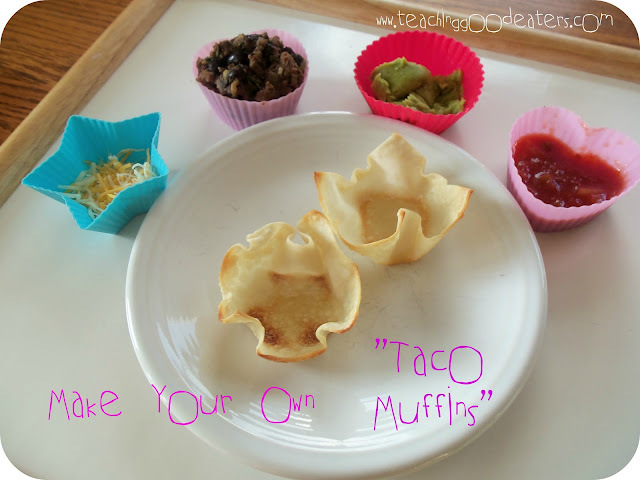 Teaching Good Eaters: Taco "Muffins"
Yum, yum, yum. This is one of the best recipes I have ever tried and my family has declared it a definite keeper! A few weeks ago, I saw a recipe for Taco Cupcakes from Emily Bites on Pinterest (by the way she has a lot of other "cupcake" recipes that you should check out as well!) Quite often I pin a recipe and then forget about it, but I could not get this one out of my mind! I made some changes to the recipe and since one of my friends has dubbed me the muffin lady (have you tried my Green Monster Muffins yet?? 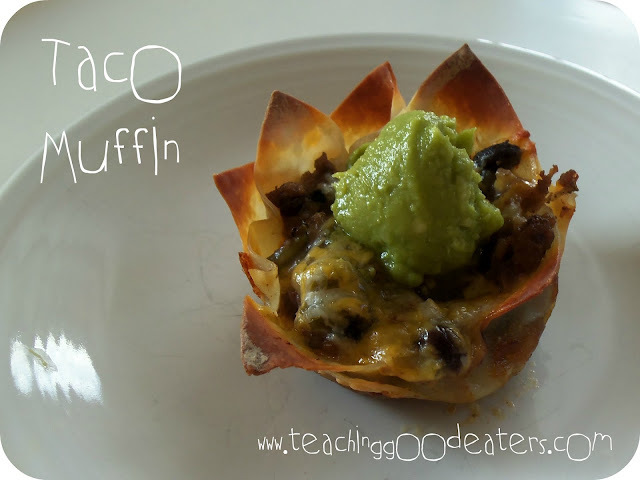 ), I have renamed my version "Taco Muffins." *You could also sub chopped mushrooms for the meat. Cook the ground beef and onions in a large skillet. When beef is nearly cooked through, add the black beans, and chopped zucchini. Continue to cook until beef is no longer pink and zucchini has softened. Remove meat and bean mixture from the heat. Tilt the pan and push the meat and veggie mixture to the side to create a small pool of cooking liquid, if none remains, add about 1/2 cup of water. Then add 1-2 T of taco seasoning (depending on how much flavor or "spice" you want.) Stir the seasoning into the liquid to create a sauce and then combine the sauce with the meat and veggie mixture. Bake for about 10-15 minutes until cheese is melted and the tips of the wonton are brown. Top with guacamole or avocado slices. I had some of the beef and bean mixture left over so I decided to create some "Make Your Own," taco muffin kits for my kids. I've had a great deal of success with make your own salad muffin tins and make your taco salad muffin tins, so I had a feeling that this would be a hit. Thanks Lisa. I promise you won't be disappointed!! I have to admit that the name of this recipe sounds terrible. I didn't want to even read the recipe...... but I did and the recipe sounds excellent. I just think it needs a new title. Oh no!! I sure don't want to scare people away with the title! Suggestions for a new name? These sound great, and I love the new look! What a fun idea! Thanks for sharing at Shine on Friday! I love your blog and I'm your newest follower:) Thanks for inspiring me! What a neat idea! I am sure that is a meal that anyone would enjoy! I know I would!!! These look great. Thanks for sharing. What an interesting recipe. Looks delicious. Glad I found it. wow what a great and fun idea! I'll have to try this sometime soon. Thanks Erika! When I wrote my spice post, I realized that I haven't had these in a while! Looks like I need to go track down some won ton wrappers! Where do you find those? I have actually found them in the refrigerated section of the produce department at my grocery store… Different stores may stock them in different places (for me it was Giant.) Not sure why it fits in produce, but it may be that most Asian sections aren't refrigerated. Interesting. I'll have to keep my eye out for them. Thanks!